Washington, D.C., October 19, 2014 — Sunday's issue of T: The New York Times Style Magazine features a spectacular orange page designed by the artist Jenny Holzer showcasing the National Security Archive (www.nsarchive.org). The Times asked Holzer and 14 other prominent artists to produce a page apiece in an "Advertisements for Myself" series. 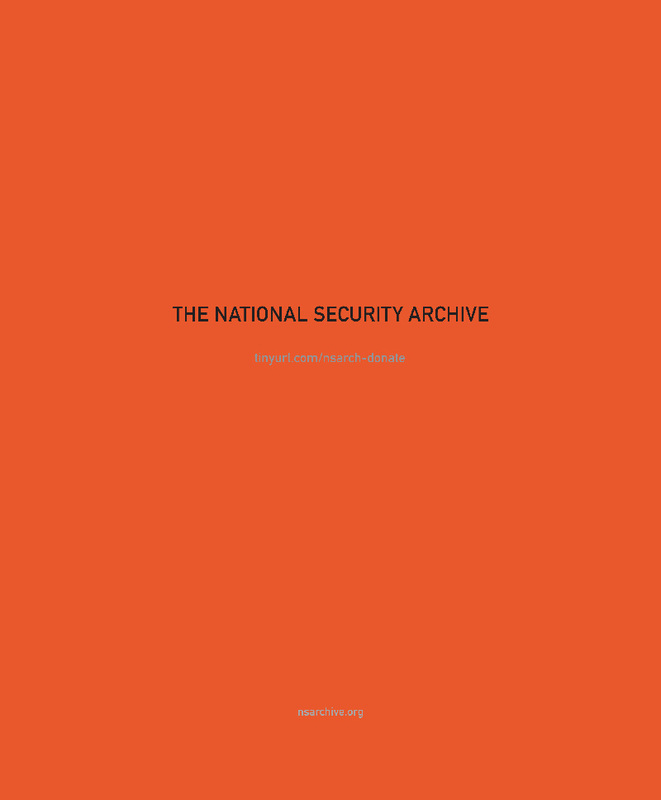 Holzer devoted her page to a Malevich-style block of orange color with only the words "The National Security Archive" and URLs for the Archive's main Web site and online donation site. "Jenny Holzer has used text since the 1970s in her art, which has taken forms including t-shirts, plaques and LED signs. In 2004, she started to source material from declassified government documents made available to the public through the Freedom of Information Act. 'I live in the N.S.A. 's collection,' she wrote." Holzer's current exhibition, at Cheim & Read in New York City, titled "Dust Paintings," includes multiple canvases based on underlying declassified documents obtained by the ACLU, the Archive, and other researchers on subjects such as detention, interrogation, torture, and surveillance. 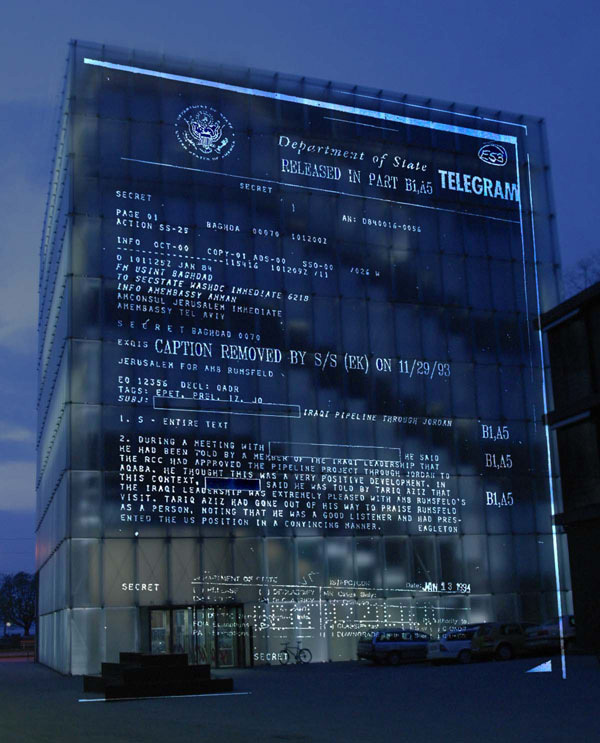 Holzer began using the Archive's documents in 2004, first in her celebrated Xenon projections in Bregenz, Austria and elsewhere, which scrolled enormous light-filled images of documents up the sides of buildings and embankments. Archive director Tom Blanton commented at the time, "Jenny Holzer does for the digital age what a nail and broadsheet used to do, for example, when Martin Luther pounded his theses onto the church door. She turns every surface into a page, she illuminates not only text but perception, and by projecting these secrets into the night she transforms the words of power into transitory bolts of lightning." Holzer subsequently produced series of extraordinary paintings using declassified documents as a starting point, including her "Redacted" (2006) and "Endgame" (2012) series. "Jenny Holzer's paintings transform both text and black blotches into blocks of color that invite multiple levels of contemplation," remarked Blanton. "Illuminating the black, colorizing the shrouds, makes fun of the censors, suggests layers of meaning under there — not only text — and makes us think about what it is to see and not see, to read and to be prevented from reading, to know and not know what power is up to." Most recently, the award-winning Torture Archive project based at the National Security Archive and intended to create a permanent online institutional memory for primary sources on detention and interrogation practices, has obtained and published new and much-less-redacted versions of blacked-out documents that provided inspiration for Holzer in her paintings and projections. For example, the Holzer painting "Top Secret 3" from 2012 portrays a completely redacted TOP SECRET page from a Justice Department memorandum to a top CIA lawyer. Only the classification stamp and the page number were left when government censors released the page the first time. The new version of the "Top Secret 3" document published by the National Security Archive included most of the complete text of the memo, which gave the CIA legal cover to torture an Al-Qaeda detainee named Abu Zubaydah, who ultimately would be waterboarded 83 times.